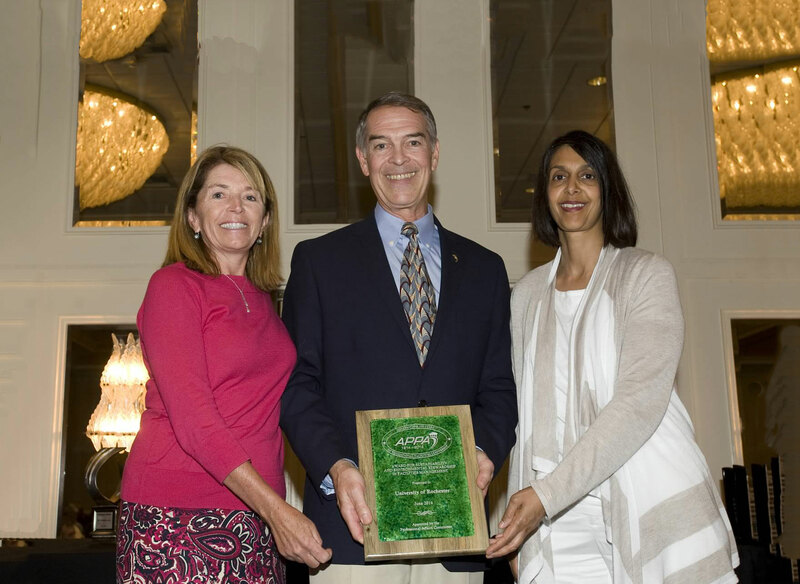 On July 24, 2014, the University of Rochester was awarded the prestigious APPA 2014 Sustainability Award for demonstrating excellence in sustainable practices for an educational facility. Members of the University’s Facilities and Services Support Operations team, Patricia Beaumont and Fazeelah Chappell, accepted the Award at APPA’s annual conference in San Diego, California. APPA promotes leadership in educational facilities for professionals seeking to build their careers, transform their institutions, and elevate the value and recognition of facilities in education.The organization works towards “adapting, enhancing, and transforming the facilities of the future,” which in turn aims to create a positive impact in educational facilities. With the increasing challenges that higher educational facilities face, such as reduced funding and an increased student body, APPA works with facilities personnel from colleges, universities and other educational facilities to share best practices on how to accomplish more with facilities with less resources. There are over 1,300 APPA member institutions across North America. The University of Rochester has been a member of APPA for over twenty years. The Sustainability Award is designed to “recognize and advance sustainability in educational facilities.” There are seven categories in which an institution is judged – Educational Curriculum and Research, Leadership and Administration, Maintenance and Operations, Energy and Utilities, Planning and Construction, Sustainability Indicators, and Sustainability Innovations. The applications are evaluated by APPA’s Board of Directors to gauge the applicant’s “current level and effort of a facilities management department and the integration with the academic curriculum of the institution.” The University of Rochester’s facilities and services department was recognized for this award for integrating sustainable policies and practices throughout all areas of our institution. The University of Rochester stood out from other applicants in several areas. For example, the University established a Sustainability Task Force that demonstrates clear goals in environmental sustainability initiatives and operations, which are articulated in a Statement of Commitment to Environmental Sustainability Principles. Additionally, the University’s emphasis on education and spreading awareness has made a great impact to the University Community and beyond. With sustainable efforts such as building to a minimum standard of LEED Silver for all new construction projects, sustainable landscaping, recycling programs such as Shred Fest and E-Cycle Day, a fleet of alternative fuel vehicles, publications such as The Green Dandelion and UR Green News, energy reduction projects, and an extensive Earth and Environmental Sciences department, the University of Rochester has worked tirelessly to earn this award. Sustainability has been a factor in almost every decision regarding the evolving landscape of the University.